Merlin - ZineWiki - the history and culture of zines, independent media and the small press. Caption: "This world ain't big enough for both of us!" Merlin was a science fiction fanzine by Lee Anne Tremper, now Lee Anne Lavell. Merlin was published in the 950s in Indianapolis, Indiana, U.S.A. 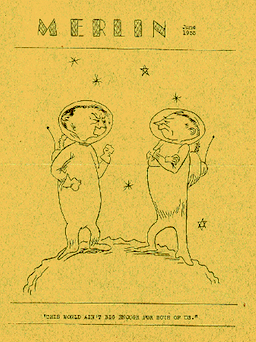 It began life as ISFANEWS, the club zine for the Indianapolis Science Fiction Association. As Lee Anne writes in Askance #9, from July 2008, "It was a one and half page thing that was mostly meeting notices although I did manage to pick up a column in its later days." "...Isfanews started getting contributions and I changed the name to Phobos, a bi-weekly eight pager that rather quickly got overwhelming, so on came another change to Merlin which, while later, came out only monthly." At least 12 issues of Merlin appeared in 1954 and 1955. One issue featured the story "The Sirens of Space" by Dave Jenrette (later co-editor of Tabebuian), which was later republished in Infinity Science Fiction. In another issue, Buck Coulson (Yandro) contributes an article on "Foreign STF". Contributors of art work included Dave Jenrette, who did the covers for 3 or more issues. The August 1955 issue features photos from Midwestcon of Robert Adair, Robert Bloch, Leigh Brackett, Robert Briney, Dennis Campbell, Sidney Coleman, Buck Coulson, Juanita Coulson, Beverly DeWeese, Gene DeWeese, Harlan Ellison, Joe Gibson, Evelyn Gold, Delray Green, Marty Greenberg, Dave Kyle, Frank Robinson, Ed McNulty, Sam Moskowitz, and Rog Phillips. Lee Anne Lavell also co-edited Indiana Fantasy with Ray Beam in the 1950s, and went on to publish the fanzines Space Cage in the 1960s and, with Jim Lavell, co-published Embelyon in the 1970s. This page was last modified on 3 June 2014, at 03:57.